Throughout AC2015: Come and See, young adults gathered for dinner and small group conversations to discuss how they can better work in partnership with the church body as the Louisiana Conference moves forward. 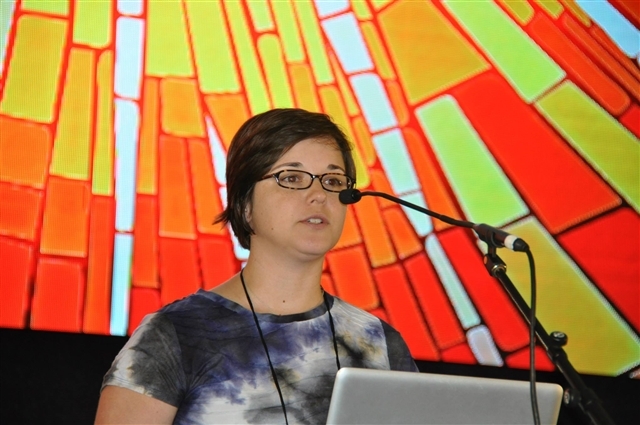 More young adults in the Louisiana Annual Conference sessions were involved as either lay members from local churches, district delegates or observers, according to Rev. Don Cottrill, provost. These persons, falling into the 19-35 age bracket, presented a summary report of their collective conversations on Wednesday morning of AC2015. Jennifer Swann, lay leader for University United Methodist Church in Lake Charles, said during the presentation, “It only takes just one” person to turn a person away from church—or to convince them to come to church. Fortunately, Jennifer witnessed what had happened. Her friend was hesitant to return, but Swann convinced her to stay for Sunday school. “Ninety-nine percent of people know what to say in that situation. But it only takes one person,” said Swann. “I have three small kids of my own. They’ve done everything from running down the aisle to stripping in church,” she said, drawing laughter from the conference members. The happy ending to this story is that Ashley joined the church and now leads its young adult Sunday school class. “It only takes one person to redeem a situation,” reiterated Swann, who in addition to serving as University UMC’s lay leader, is also a Stephen Minister and the leader of the 20s and 30s group at the church.